lt;stronggt;RCPT255lt;/stronggt;lt;BR/gt;Rubbermaid-White Rough Pro Looped Mop Head 12 Per Caselt;BR/gt;Sturdy mop head design withstands the tough abrasions found in nonslip tile, concrete, or raised textured and stone floors. Features twice the absorbency and release of conventional mops, making it perfect for use in high-traffic foodservice establishments, commercial buildings, retail buildings and hospitality environments. Knitted white cotton/polyester fleece blend attracts and retains dirt particles. Looped-ends and tailband aid in launderability. 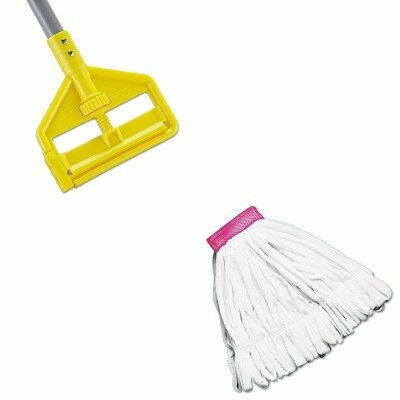 Head Type: Wet Mop Application: Floor Maintenance Mop Head Style: Looped End.lt;BR/gt;lt;BR/gt;lt;stronggt;RCPH146lt;/stronggt;lt;BR/gt;Rubbermaid-White Rough Pro Looped Mop Head 12 Per Caselt;BR/gt;Easy-change, side-gate design allows you to quickly slide mop heads on or off. Adjustable thumb wheel enables stress-free, tight and secure clamp down. Solvent- and acid-resistant frame enables use with all commercial floor stripping agents. Handle Length: 60amp;quot; Handle Diameter: 1amp;quot; Handle Material: Fiberglass.